I’ll cut right to the chase: Lola in Seattle is one of my favorite restaurants anywhere. Everything I have had is delicious, and even when I’m stuffed, I keep eating because the pain of being full is absolutely worth the pleasure that comes from absolutely every item on the menu. 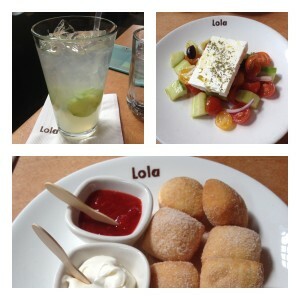 I mentioned the amazing tzatziki and the fresh donuts in my post highlighting which Tom Douglas restaurants I enjoyed while in Seattle, and while all are worth a full article, I’ll start with Lola. Everything is amazingly fresh and just so tasty. It is how all food should be. So what are the best parts of this great restaurant? While it’s hard to choose, I’ll give you my take, but it has no shortage of accolades if you need more convincing. But come on, people, Tom Douglas won when he was a contestant on Iron Chef America, so if that doesn’t mean something to you, I don’t know what would! • Lola makes their pita bread! Pita bread on its own isn’t the most exciting bread in the world, but at Lola, it is incredible – warm, soft, a slight grilled taste, covered in rich olive oil and salt. You almost don’t need the dips, but they are so good, you’ll want to try at least a couple. And order extra pita. You’ll be glad you did. • The tzatziki is out of this world. While I mentioned this before, it is amazing that tzatziki is another items that is so simple, but when done right, you can’t help but wonder why all simple food can’t be so amazing. I recommend ordering it as an appetizer and then ordering the kabob of your choice since many (maybe all, but I haven’t had them all, although I would like to) also come with a side of it. • They know what skordalia is and they do it right. Not to harp on the spreads too much, but I’m one of those people who could make a meal out of the appetizers. • The made-to-order donuts that Giada de Laurentiis raved about in the Food Network’s “The Best Thing I Ever Ate” are even better than she expressed, and she did a pretty good job. It is hard to put it into words, but no matter how full you are, the donuts are not to be missed! Trust me. In fact, get two orders per person! • Open for three meals a day. That is nice. You could eat there multiple times in a single day and the food is so good, I certainly would if I still lived in Seattle. While I haven’t experienced the joy that appears to be breakfast, it’s on my list for next time. Bottom line – don’t miss it if you make it to Seattle! While I could go on and on about everything from the wine and drink list to the desserts, there isn’t a bad item on the menu, so start with a few things and work your way around. The food , sights and the market in Seattle were phenominal. The Washington wines were very good.